Diffusion MRI is a powerful medical imaging tool for noninvasive mapping of the neuroanatomy and brain connectivity. Spatial resolution is one of the keys to obtain accurate microstructural information from diffusion MRI. 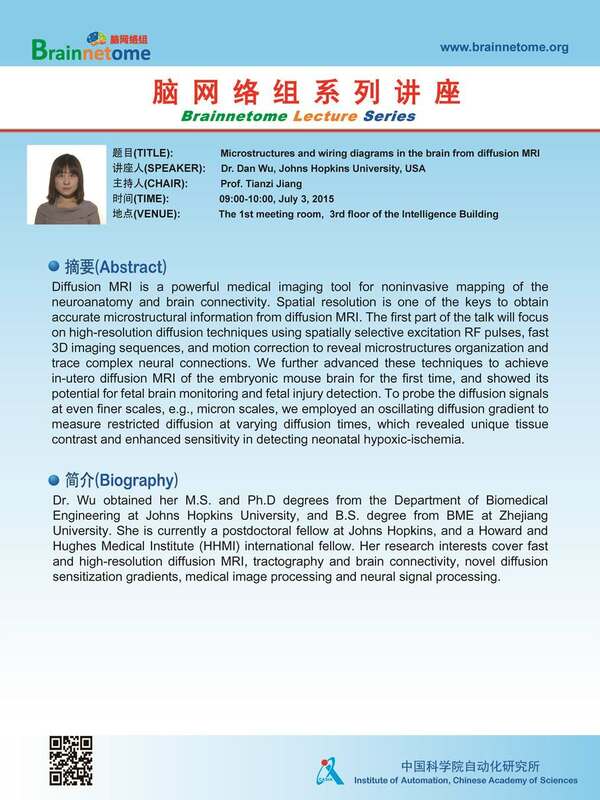 The first part of the talk will focus on high-resolution diffusion techniques using spatially selective excitation RF pulses, fast 3D imaging sequences, and motion correction to reveal microstructures organization and trace complex neural connections. We further advanced these techniques to achieve in-utero diffusion MRI of the embryonic mouse brain for the first time, and showed its potential for fetal brain monitoring and fetal injury detection. To probe the diffusion signals at even finer scales, e.g., micron scales, we employed an oscillating diffusion gradient to measure restricted diffusion at varying diffusion times, which revealed unique tissue contrast and enhanced sensitivity in detecting neonatal hypoxic-ischemia. Dr. Wu obtained her M.S. and Ph.D degrees from the Department of Biomedical Engineering at Johns Hopkins University, and B.S. degree from BME at Zhejiang University. She is currently a postdoctoral fellow at Johns Hopkins, and a Howard and Hughes Medical Institute (HHMI) international fellow. Her research interests cover fast and high-resolution diffusion MRI, tractography and brain connectivity, novel diffusion sensitization gradients, medical image processing and neural signal processing.